For years, I and my colleagues at the Responsible Sourcing Network (RSN) have been talking about the forced labor conditions of children and adults in the Central Asian country of Uzbekistan, where students could be expelled and nurses or teachers lose their jobs by their government if they don’t toil in the cotton fields doing backbreaking work every fall. For years, we have asked well-known brands and retailers to sign the Cotton Pledge we wrote to not source Uzbek cotton and to follow our Next Steps to make their commitments a reality. One of the main problems, however, is that brands do not even know where their cotton comes from. How can brands be sure they are not unknowingly using cotton harvested by a nurse in Uzbekistan or a teacher in Turkmenistan, which also has a government that orchestrates forced cotton picking throughout its country? The reality is that most brands are not 100% certain where all of the cotton in their products originates. Most brands also are not making sure their suppliers’ suppliers are not purchasing Uzbek or Turkmen cotton, or any other cotton harvested with forced labor. Supply chains can be massive, complex, and opaque, and there has not yet been an easy way for brands to understand where their cotton comes from. We at RSN have developed a solution to the above conundrum in YESS: Yarn Ethically & Sustainably Sourced. YESS will be a due diligence system to verify where cotton originates and check that yarn spinners have systems in place to avoid all cotton harvested with forced labor. To set up this system, we must go directly to the field and find out how cotton is traced through the supply chain. We will define what a robust due diligence system will look like at each tier of the chain, including farmers, traders, ginners, spinners, clothing manufacturers, brands, and retailers. In May, I went to India to find out how cotton yarn spinners track where the cotton they use is grown. For a while now I have been saying that spinners are “the missing link” in the supply chain where visibility and traceability are lost. But regarding India, it is more accurate to say that the ginners are “the missing link” of the cotton supply chain. We discovered that we couldn’t start with the spinners, we had to visit the ginning facilities to uncover where the cotton is grown. Ginners are located within a certain distance of the farms (approximately 150–200 miles), and are likely to buy cotton directly from farmers. Ginners separate the seeds from the cotton fleece, clean it, and then press about 24 feet of loose cotton into a 2 x 3 x 4.5 foot bale that weighs 4–500 lbs. 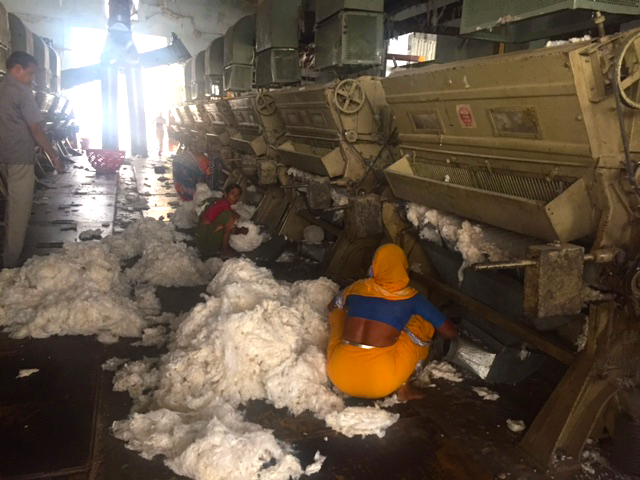 We visited four of the approximately 90 ginners with operations in Raichur, a town in the heart of the cotton-growing area in south–central India. The ginners we visited in India buy cotton from over a thousand farmers each. They told us the number of farmers they buy from is “uncountable” and they keep minimal records of the farmers from whom they are buying. This is no surprise since there are approximately six million cotton farmers in India who offer employment to 40–50 million people in cotton production and processing. Most of the farmers in India are only cultivating one plot of land under five acres in size. Once purchased, the farmers’ cotton is added to a large mountain of cotton at the gin. It is scooped up together with a small bulldozer and placed onto conveyor belts to go through the ginning process. This is one of the first places cotton from many different farms can be mixed together. In countries such as India where the majority of the cotton is hand-harvested, when the cotton is ready to be harvested, the farmers want to have the cotton picked as quickly as possible. Workers, often referred to as “pickers” are in short supply and farmers with bigger plots will use pickers from neighboring villages and towns. With conventional cotton, or cotton that is not grown in any special way such as organic or fair trade, farmers typically do not have any requirements about the ages of the workers or other labor standards. Similarly, ginners do not ask about the labor conditions on the farms where the cotton is being grown. If we want to have visibility to the labor conditions at individual farms, we are going to need a system to track the farms from which the ginners are buying. This is currently being done for Organic, Fairtrade, and Better Cotton, but not necessarily for conventional cotton. We won’t need this level of transparency for all ginners processing conventional cotton globally, but we will need to do it for ginners in what are known as the “higher risk” countries. Higher risk countries are those that are documented by the U.S. Department of Labor (DOL) to have production of various products (in this case cotton) by forced labor or child labor. Currently for cotton, the DOL List of Goods Produced with Child Labor or Forced Labor documents nine countries for forced labor and 17 for child labor. To get started with YESS, we are going to focus on the nine countries with forced labor in their cotton industries: Benin, Burkina Faso, China, India, Kazakhstan, Pakistan, Tajikistan, Turkmenistan, and Uzbekistan. Of these, we will prioritize addressing cotton coming from Turkmenistan and Uzbekistan, since all of the cotton from those two countries is currently being harvested with forced labor, orchestrated by their governments. As a result, for Turkmenistan and Uzbekistan, we will not have to trace the cotton to the farm, or even to the gin for that matter, since all of the cotton from those two countries is tainted with forced labor. We knew when we first came up with the concept for YESS that it wasn’t going to be easy. However, we also knew that standing by knowing over a million people working as forced laborers in the cotton industry was not an option. We contributed to developing a transparent system of verification with smelters to address conflict minerals from the Congo. If it can be done for cell phones and cars, we can do it for jeans and sheets. We are visiting several of the large apparel-producing countries and learning about how companies at various tiers of the supply chain source and track their cotton. As was done with conflict minerals, we are building YESS as a system the whole industry can contribute to and benefit from, thereby keeping costs to a minimum. We are investigating new technologies, like SourceMap and blockchain, and seeing where the industry is already collaborating so we can complement existing systems, such as those being developed by the Sustainable Apparel Coalition and the Social & Labor Convergence Project. With determination and tenacity we can shift the market away from exploitation of the workers who are breaking their backs for our benefit.